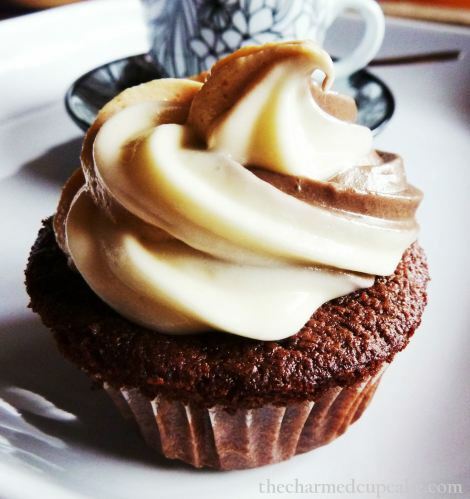 Our first entrant was Sophie from Totally Caked Out with these Chocolate Thunder Cupcakes...so named due to the fact that they were whipped up during a thunder and lightning storm! As ever Caroline from Caroline Makes was quick off the mark this month with our first caketails. 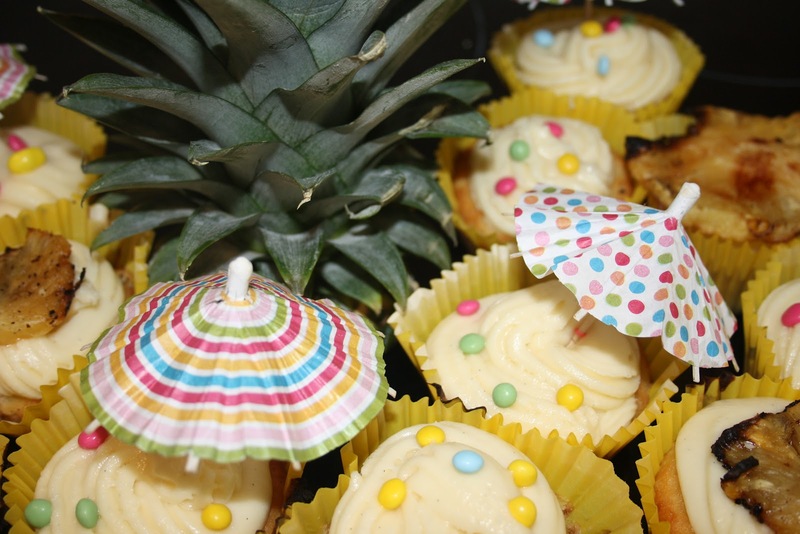 Caroline made these Pina Colada which she took as an offering to a barbeque during the summer. The recipe was adapted from one by Xanthe Milton (aka Cookie Girl). These Fruit and Nut Cupcakes came from Ryan at Baked with Kindness who won a food hamper in a blog giveaway and then used the contents to make these original bakes. They have a peanut praline on top and both chocolate chunks and dried fruit inside. Next a gorgeous flavour combination from Susie at Fold in the Flour ...Sticky Toffee Cupcakes with Salted Caramel Buttercream. I really want to try one of these, they look delicious! Susie made her own caramel after being inspired by the Great British Bake Off and the recipe for these cupcakes comes from Fiona Cairns. Here's our first entry from Mummy's Little Peeps...pretty sugar rose topped cupcakes. The sugar roses are from Cake Craft World...you can find them online. 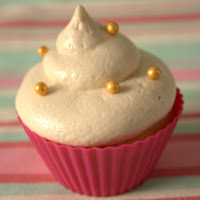 A really girlie cupcake that looks really appealing. Another origianl recipe up next. Cherry Coke Cupcakes from Lost in Austen. I've heard of baking with Cola but I've never thought of using Cherry Coke to give a different flavour. There's even a hidden surprise inside...Bonne Maman Cherry Jam! The decoration is fab too. Helene from I Cook With Butter made these great Red Velvet Cupcakes for her boyfriend after falling in love with red velvet following a visit to the Hummingbird Bakery. 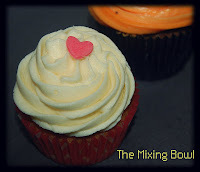 Red velvet is always a favourite, so I'm sure these cupcakes were very well received. 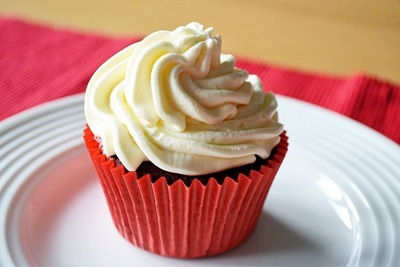 They're topped with a cream cheese frosting. Our next entry provides a little bit of indulgence, these Butterscotch Chocolate Cupcakes are from Caroline at Cake, Crumbs and Cooking and they're made from Green and Black's Butterscotch Chocolate which has little butterschotchy pieces dotted through it. They were made for a colleague who was leaving...all I can say is lucky work colleagues! Next up another caketail entry...Pina Colada Cupcakes from Janice at Farmersgirl Kitchen. These cupcakes came about as Janice was testing an Oxo Good Grips Pineapple Slicer, you can check out the video on her blog. If you can wait long enough they also improve after a day or two in an airtight container. 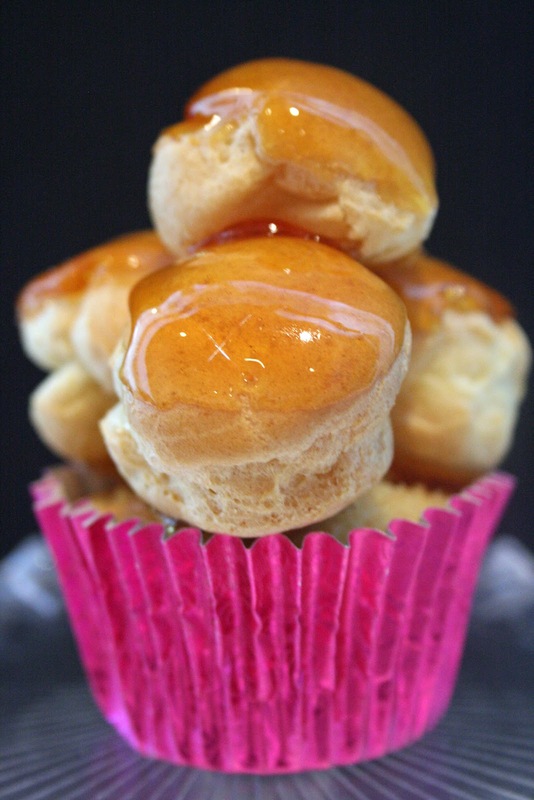 For my own entry I thought I'd try something a little bit different and something that's been on my 'to bake' list for a while...Croquembouche Cupcakes. 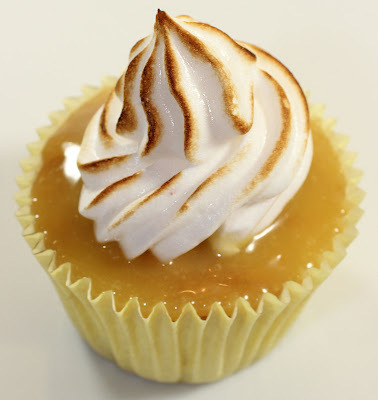 They're a combination of vanilla cupcakes with a caramel sauce centre, topped with little profiteroles filled with cream and finished off with caramel. 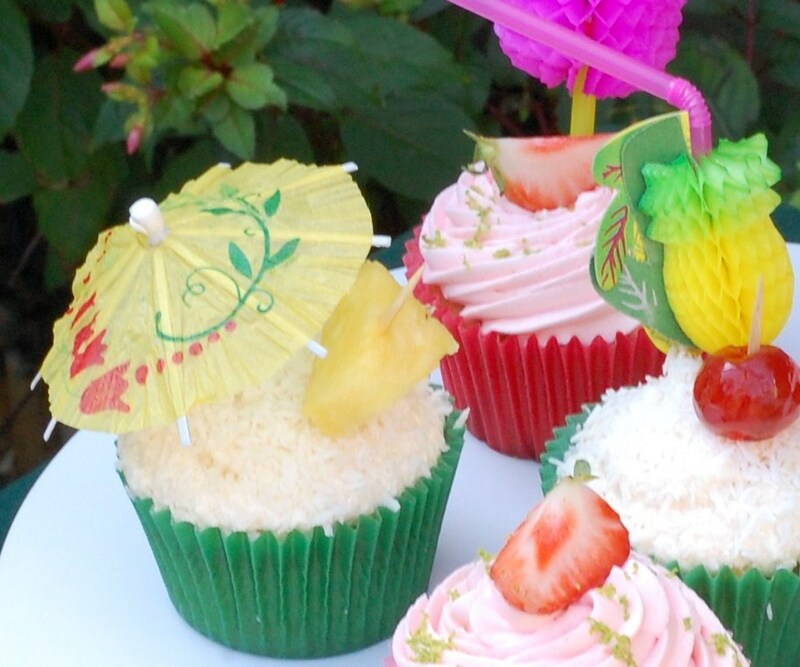 These strawberry cupcakes are a delicious entry from Johanna at the Green Gourmet Giraffe. There are little pockets of strawberries baked into the cakes and they were perfect for decorating with kids. It's onwards and upwards with an entry from Easy Peasy Cooking, these ice-cream cupcakes are a novel idea as they're baked in an ice-cream cone. They're great fun and would be great at a kid's birthday party...or for big kids at a summer barbeque! 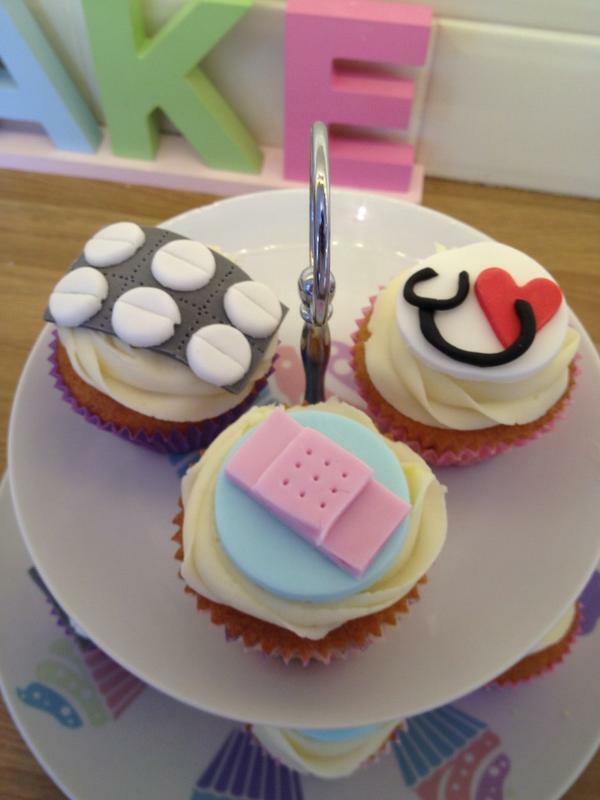 I love the next entry...medical cupcakes from Cat Haslam...perfect if you're feeling under the weather. 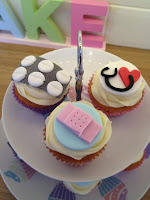 I'm sure patients and doctors would both appreciate these...lovely sugarcraft skills too! 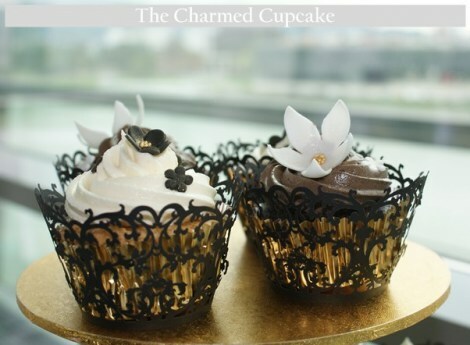 Next up...not one, not two, not three but four entries from Angela at the Charmed Cupcake. 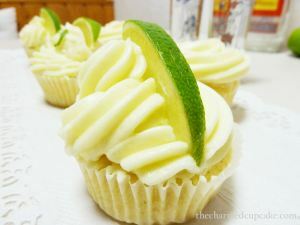 We have Nutella Cupcakes, Black and Gold Cupcakes, Sun-dried tomato Cupcakes and my particular favourite ...Magarita Cupcakes. 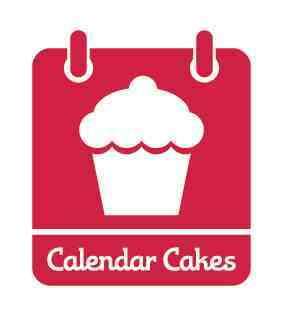 All are beautifully presented and you can check out Angela's blog for many more fabulous cakes. 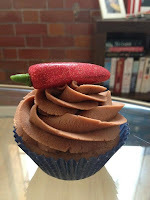 Another stunner from Sarah Mcilveen ...Chilli Chocolate Cupcakes with a glittered marzipan chilli...brilliant! Again a novel idea with the chilli inspiration coming from Cox Cookies and Cakes. The glittered marzipan chilli on top looks perfect! It's onto our second entry from Mummy's Little Peeps...Vanilla Rose Cupcakes...these are pretty as a picture and wouldn't look out of place in an English country garden. Next up a double dose of caketails with Pina Colada and Strawberry Daqiuiris from Lucy at Vanilla Frost. These were made for a 40th birthday cocktail party and were served alongside boozy jellies. The recipe for the Strawberry Daiquiri cupcakes came from the Hummingbird Bakery 'Cake Days' book and involved soaking the strawberries in a rum and sugar syrup...yum! 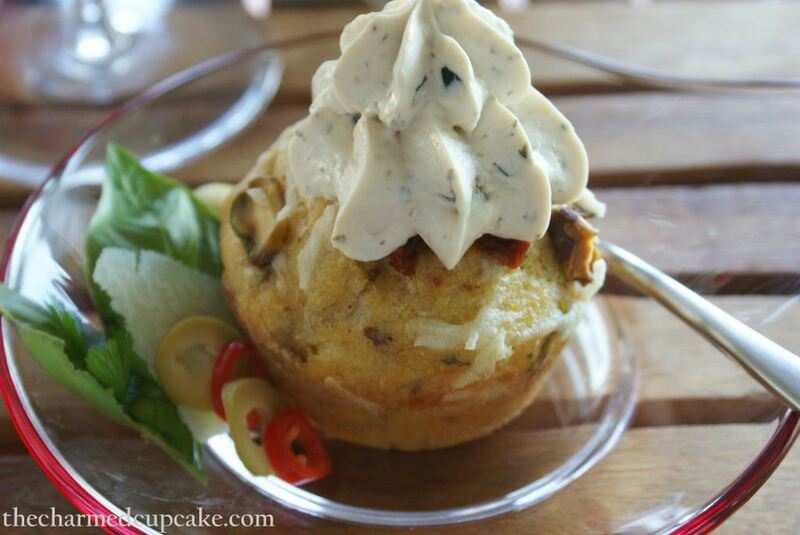 A twist on the cupcake theme with a 'Cupcake Cupcake'. 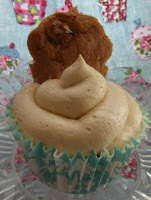 Coffee cupcakes with a walnut cookie shaped like a cupcake! These are from Rachel at Blissfully Scrumptious and they were inspired by the Sweet Bitesize Bakes book from Maison Cupcake. Anyone for Pimms...it may be Pimms O'Clock! 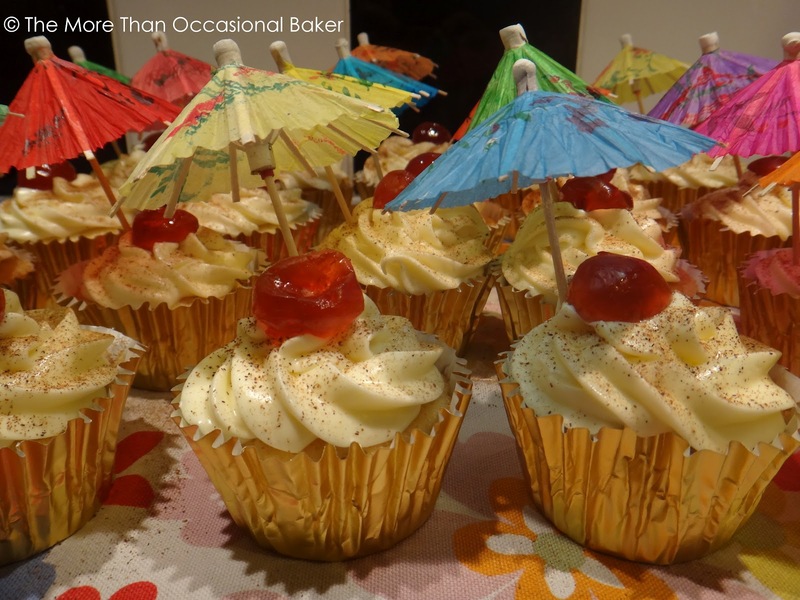 Olivia from Liv a Little Bakery made these lovely Pimms Cupcakes which just make you think of summer...they're light, fresh and fruity and perfect served with what else but a jug of Pimms! 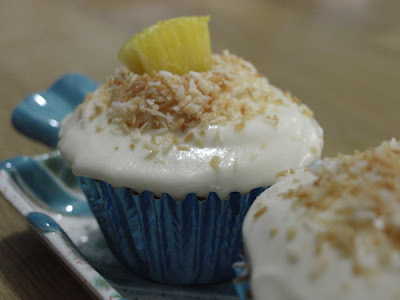 An unusual bake next...Hibiscus cupcakes from Jen at Blue Kitchen Bakes. The flavour comes from Hibiscus tea. The icing also has Hibiscus in it...these are definitely very interesting and I wouldn't mind giving them a go! 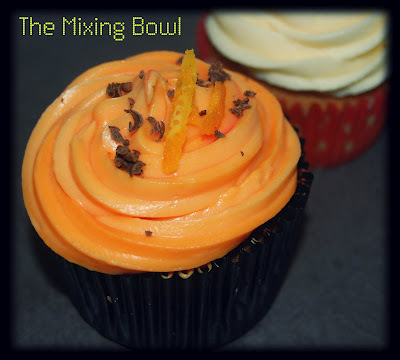 It's more tangy curd cupcakes next but this time Orange and Passionfruit Cupcakes from Angela over at Garden, Tea, Cakes and Me. Angela found the passionfruit and orange curd at Mikes Homemade and the cupcakes themselves have both orange juice and orange zest baked inside. Ruth from Mixing Bowl Magic has been baking up a storm with a new job in a Cupcakery and you can check out some of her creations over at her blog. 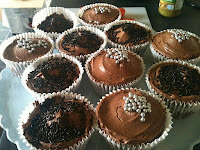 Ruth made Chocolate Orange Cupcakes and Amaretto Cupcakes for her last day in the office. Fudgy Cupcakes with Fudge Icing from Helen at Fuss Free Flavours. These little beauties are topped with proper frosting made with Trex (vegetable shortening) and icing sugar, Helen even makes her own fudge sauce which was combined into the frosting. These look like fudgy perfection! These Flower Garden Cupcakes are the third entry from Mummy's Little Peeps...they're so cute and if you want to recreate the grass effect you can whip up some green buttercream and use a 233 piping nozzle. To complete the garden theme, little flowers and butterflies were added to the top of each cupcake. 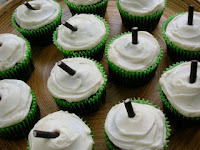 The penultimate bake is from Chocolate Log Blog with Chocolate Mint Rum caketails. You can find the great 'We Should Cocoa' monthly challenge over at Choclette's blog...unsurprisingly it is a chocolate challenge and this month the theme was cocktails to celebrate We Should Cocoa's second birthday....hence these cocktail inspired cupcakes. Create the authentic straw effect with Elizabeth Shaw Mint Batons. So there we have it, a spectacular cupcake round up! Thank you to everyone who took part, we really appreciate you taking the time to share your creations with us. If you'd like to join in with this month's Halloween Cake Spooktacular then check it out over at Dolly Bakes who is hosting October's Calendar Cakes Challenge.